Since 1999, Northcliff High School in Johannesburg has toured its annual musical production to the Playhouse in Durban. 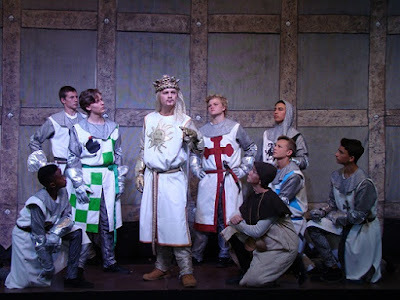 This year, the 19th year of this great tradition, it is the hilarious Monty Python’s Spamalot The Musical based on the film Monty Python And The Holy Grail. Once again, Johannesburg audiences are voicing their praise and hinting that this might well be the best offering yet from the school that has achieved renown in their brave initiative to be possibly the only school to tour a full musical production from home to another far-off city. Arthur, chosen as king in the mysterious Lady-Of-The-Lake Excalibur ceremony, gathers knights from every corner of the land to sit at his very, very, very round table. He and his knights are then charged by God, in those troubled times, to go on a quest to find the Holy Grail. The result is a cavalcade of ridiculous nonsense that will have the audience in stitches! The book and Lyrics are by Eric Idle, with music by John du Prez & Eric Idle and this is all from the original screenplay by Graham Chapman, John Cleese, Terry Gilliam, Eric Idle, Terry Jones and Michael Palin. Spamalot is directed and produced by Nick Jourdan who has been responsible for the many successful Northcliff productions that have toured to Durban over these many years. The show will run at the Playhouse Drama from July 4 to 9 and booking is at Computicket.